Have you heard of the helichrysum plant? It's part of the sunflower family—you can see the resemblance—and includes about 600 species of flowers. Some are annual, some are perennial, but they're all colorful and perfect for brightening up a bouquet. Helichrysum is also used to make an essential oil that's known by other names, including “everlasting” and “immortelle.” The oil has been used historically for skin. 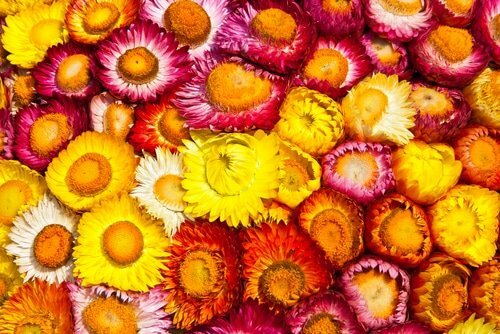 Helichrysum oil could help even the appearance of your skin tone. The name “helichrysum” comes from the Greek word “helisso,” meaning, “to turn around,” and the word “chrysos,” which means “gold.” In fact, in historical times, the flowers of the plant were dried and offered to the Greek Gods. Though there are many species of helichrysum, the one that's typically used as an essential oil and natural remedy is the italicum species. This species is a small, perennial shrubby herb with narrow, silver-hairy leaves and small, yellow, straw-like flowers. When crushed, these flowers release a distinct, curry-like aroma. The names “everlasting” and “immortelle” come from the reputation of the flowers for retaining their brilliant color even when dried. In aromatherapy, helichrysum is thought to open the heart and help soothe old emotional wounds. The scent is also said to help one feel secure and safe. Like most plants and flowers, helichrysum has long been used as a natural remedy for certain health conditions. It was used in tea to treat respiratory conditions and to soothe bronchitis and coughing. Listed as non-toxic, non-irritating, and non-sensitizing, it also has a reputation for being an effective pain reliever because of its anti-inflammatory properties. Helichrysum is also known as a detoxifier, supporting the liver in getting rid of waste in the body. Helichrysum is great for those with oily skin. In addition to this, it's one of the few essential oils that contain “diketones,” which can help reduce the appearance of age spots and discoloration. Helichrysum is touted as the perfect addition to skin care formulations for those with sensitive skin. It's so gentle that it's even recommended for children — in fact, it's often compared to chamomile because of these properties. Of course, like most oils, helichrysum is moisturizing, and will help prevent dryness. One of the most exciting newer discoveries with this oil, however, is its anti-aging property. It's perfect for helping to make skin look more firm, youthful, and vibrant. Helichrysum may not be one of the more popular oils, but we think it should be. So many benefits in one ingredient! Try it in our Radiant Skin Silk Body Lotion and see what you think. We'd love to hear about your experience. Do you use helichrysum in your skin care or in other areas of your life? Please share your tips. I use this in a facial oil base of argan, evening primrose oil, black currant seed oil and borage oil. And also some lavender and carrot seed essential oil. My skin has never looked better! Thx for your article and the beautiful picture. I never knew what it looked like! So cheerful! Helicrysum also great with a few drops added to shampoo to produce soft, silky and hair with more bounce! Also, I believe I was getting an aneurysm, as I had intense pain in my head and blood shot eyes. Applied helicrysum to the top and sides of my head, along with grapefruit oil, and the pain stopped immediately, with repeated applications, the eyes cleared up, also. I believe the blood vessels must have tightened right up. Never felt better after that! Use those oils occassionally in that way, as well as in shampoo to keep feeling so good. Thx for spreading the good word about helicrysum!! Found your article after doing a google search for EO’s and scar appearances. You have written a wonderfully informative article and I have it bookmarked. Wow! Thanks Sam. So much great info in your short paragraph. Did Anne Marie use this for stretch mark prevention? I heard about this ingredient before , but now I will try it for sure.Thanks for the in-depth detailed article. Yes, I agree with you on helichrysum oil. I make my own eye cream using great carrier oils and helichrysum essential oil in it. Absolutely love to see effects. Used on my teens scars from zits, applied topically on galbladder area to detox and aid digestion. Using my eye cream as a lipbalm as well. I am buying this for my husband. He has very bad wounds on his hands due to neuropathy. How do I use this. Also I keep hearing for l how it’s good for mood upper. How do I use this for that. So confused. And is there an oil for neuropathy? I use it in my tattoo aftercare, BombBalm, and it is almost unbelievable how amazing it is! I made this product and sometimes I get skeptical of how awesome it is. It’s really amazing to see essential oils work and go above and beyond your expectations. I’m an absolute believer in this oil. I only wish it wasn’t sooooo expensive. Although it definitely is worth it! I use helichrysum in a organic rose hip oil serum with palmarosa. It has helped to reduce breakouts and improve my skin overall. Is this the best routine for a 23 year old? How often? I have heard wonderful things about Immortelle oil for scarring/burning/post surgery healing …I also am a believer in St. John’s Wort Oil for burns. Depending on the severity of the burn, I’d recommend applying either oil 2-3x a day on the affected area. As for internal supplements, Vitamin A and C are both great to assist in healing.. If you have any other questions, let us know! I just used this as a first aid also is said to help reduce bleeding in my book that I researched it totally work!! Also not to mention it is wonderful for varicose veins! I put it on my legs every night! Wow thanks for sharing Sam, sounds like you have this one down! Sounds good enough to try, making a note as I type :). Make it a wonder-filled day.